In the digital age of texting, Kathleen Watson still understands the importance of a finely crafted sentence. She knows the right words and the right punctuation can earn respect and wield power. She also knows the wrong words and wrong punctuation create confusion. Watson is founder and proprietor of Ruthless Editor, a writing and editing business. The former Janesville woman returns to the city Tuesday, June 12, to talk about self-publishing and the importance of good grammar. In almost three decades of being in business, she has written newsletters, news releases, company histories and brochures for many Janesville businesses and groups. Watson understands how critical business writing is to the bottom line. She cites an article in the Harvard Business Review that says bad writing costs U.S. businesses $400 billion annually. The reason? Poorly written material wastes time. One of the honors of Watson’s writing career was chronicling the restoration of the Wisconsin Capitol, which began in 1988 and was completed in the early 2000s. JP Cullen was the primary contractor. Watson wrote about a carpenter’s poignant discovery when he removed hardware from the Capitol’s massive wooden doors. On the wad of paper was a message signed by a contractor who proudly worked on the original 1917 Capitol. Remarkably, the carpenter who left the note was the grandfather of the carpenter who found it. Watson’s Janesville roots had a big influence on her path to becoming an editor. In junior high school, she learned how to diagram sentences so she could visualize how all the parts fit together. During Watson’s senior year, English teacher Dorothy Nuzum emphasized the importance of rewriting until something is right. Watson graduated from Janesville High School in 1962. She earned a bachelor’s degree from UW-Whitewater and a master’s degree from Northwestern University. Both were in communication. In 1989, Watson launched her writing and editing business. She moved from Wisconsin to Arizona in 2009 and spends summers in Prairie du Sac. After a lifetime of caring about clear communication, she is concerned about the future of good grammar. Young people who text choose their language and understand each other. 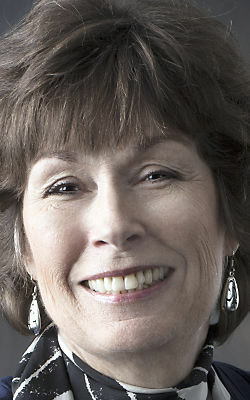 Anna Marie Lux is a Sunday columnist for The Gazette. Call her with ideas or comments at 608-755-8264, or email amarielux@gazettextra.com. When: 6-7:30 p.m. Tuesday, June 12. Where: Hedberg Public Library, 316 S. Main St., Janesville. Details: No registration required. Watson will discuss 10 essential publishing elements. Contact: Kathleen A. Watson’s email: contact@RuthlessEditor.com. Blog: www.RuthlessEditor.com.